When Facebook (s fb) first launched its platform strategy in 2007, it seemed as though a new world of opportunity had opened up for anyone interested in the social web — a kind of social operating system that they could build on and extend. Did Facebook smother the potential of that idea by closing off its platform and building a proprietary walled garden instead? Pando Daily writer Hamish McKenzie argues that it did, and it’s difficult to find much fault with his analysis. All of which raises an interesting question: What could Facebook have become if it had chosen a different path? And what have we lost in the process? Anyone who was following Facebook at the time probably remembers the kind of excitement among startups that McKenzie describes in his post, and the rapid emergence of companies such as iLike and Slide, who quickly built a slew of apps and services — viral games, music-sharing apps and other add-ons — that used the Facebook API, in much the same way that desktop software uses Windows or the Mac OS. The opportunities seemed limitless. 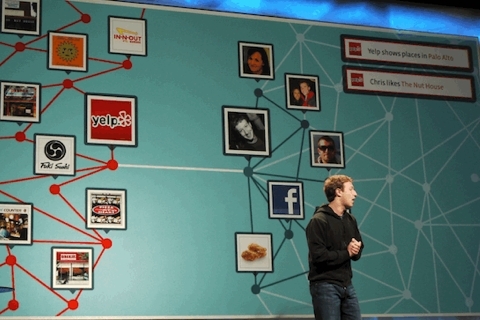 In fact, many of those writing about the launch of the platform and the “social graph,” which took place at the company’s inaugural f8 developer conference in San Francisco, used the operating system metaphor to describe what the social network was building — and founder Mark Zuckerberg talked at length about the freedom that developers and startups would have to build not just applications but even “new industries” using Facebook as a foundation. Instead, Facebook started to tinker with its platform fairly quickly — not just limiting what developers could do with the API, but closing off whole sections of what the platform used to allow, in part to make it easier for the network to build or promote its own similar features and applications. By the time Facebook launched the “open graph” evolution of Facebook Connect in 2010, it was obvious that all of this openness was designed to generate benefits for Facebook, not to make it easier for developers to build interesting applications. Facebook-based app developers such as Slide and iLike ultimately withered and were sold for a fraction of their earlier valuations, and building something significant on top of Facebook stopped looking like something for startups to aspire to. Even Zynga, which had become a kind of poster child for the benefits of the Facebook platform, started to decline in value. And it’s worth noting that Facebook’s lack of openness wasn’t just an impediment to startups or developers — it also had real impacts on what users could do with their data and the interoperability of apps and services. In hindsight, it almost seems absurd that anyone thought Facebook would actually build something approaching an “open” platform or a level playing field, or that it wouldn’t pull whatever levers were necessary to tilt the balance in its own favor and keep the most valuable real estate and data for itself, just as Microsoft and Apple have done with their own platforms. As a number of advocates of openness have argued — including Sir Tim Berners-Lee — there is only one truly open platform, and that is the web. Proprietary networks like Facebook are designed to generate value for their owners, period. McKenzie and others quoted in his post make the point that Facebook’s focus on short-term platform goals may have prevented it from capitalizing on a number of potential opportunities — including mobile. If Facebook had tried to be more open or egalitarian, could it have built itself into something like Android, which has created an ecosystem that now rivals Apple’s in some ways? Instead, Facebook has to made do with launching a kind of home-screen replacement for Android devices, which few people will use and will likely generate little long-term value. What if Facebook had taken another path? In a sense, Facebook’s dilemma around open vs. closed platforms and the choices it has made along the way look very similar to what Twitter has been going through, as it has evolved from being an open network into a media entity that controls every aspect of what happens on its platform and only works with certain preferred partners. Instead of an open, federated messaging network for information, we have a company priming itself for an IPO by serving you ads based on what TV show you just watched. Whether Facebook made the right choice likely won’t become obvious for some time, if it ever does. But it’s worth wondering what might have happened if it had chosen a different path — and what both Facebook and users have lost as a result of the choices it has made. Tech geeks love “open”, but in a business context it rarely makes the most money. Last time I check Facebook was a business. It is unfortunate that current funding models strongly favour closed ecosystems. An open social graph and an open network for sharing 140 character thoughts would arguably create far more wealth for the world (if not their investors) by encouraging extension rather than duplication of efforts. Can we expect the lessons learned from Facebook and Twitter to be applied to emerging ecosystems such as the Internet of Things? 1) Facebook should have (or still should) completely rebuild HTML5 from the ground-up (or just call it HTML6) and turn into a developer platform that interoperates with all apps, all platforms at speed/performance that rivals native. Do it in partnership with Samsung (for distribution). 2) I’m perplexed why Facebook isn’t capturing transactions. Discovery around friends should be bottom of funnel experience. At end of the day, ads are middlemen and goal is transactions. 3) Shift to mobile combined with IPO revenue needs re-prioritized their platform roadmap. So mobile developer platform became missed opportunity. I do bet they “saw it” and still do. 4) Pages should be the social operating system of local commerce. Not Groupon, etc. 5) Biggest threat to FB is the contact list API that mobile offers developers. It unbundled Facebook’s control over the social graph “friend” list as primary user-acquisition/distribution channel for apps. Upside of a Facebook/HTML6 platform/OS is the contact list could be re-bundled and Facebook could a) read data from non-FB users and/or non-FB connections and b) re-target ads into application layer of the phone. 6) Introducing celebrities into the graph unbalanced the perceived incentives for content creators. All of a sudden, aunts, grandpas, etc. compete for distribution amongst Bieber & co. Everything they do should be to tie together closed connections even tighter so perceived value is Facebook = greatest distribution channel for content creators wanting to share amongst its tightest network. Facebook has (had) a monopoly in friend-to-friend distribution. I would adjust algo to get that back. 7) No doubt that mobile is slowly shifting discovery from search (google) to apps. Consumers finding things inside apps first, not search. Can’t underestimate this shift. It’s an opportunity for Facebook to come in at the mobile OS layer. 8) Advanced distribution for movies and music could be happening at scale on the Facebook platform. In exchange for revenue share + guaranteed distribution (Facebook can offer guarantees, which makes it such a unique beast in game of content distribution), movie studios and artists could what Jay-Z just did on steroids. Facebook distributes in advance, users pay for access, everyone wins. Considering that Facebook gets more annoying to use every time they update, I am inclined to agree that they would have been better off with an open platform. It seems like they could use the help… I cannot wait till someone less annoying comes around to replace them. Tudo que faÃ§o gosto de ir atÃ© onde posso,comecei no facebook foi dificil nÃ£o tinha muitas opÃ§Ãµes tive uma ideia de buscar amigos fora do Brasil derrepente fiz amizades com o mundo todo, sÃ³ tenho a agradecer um sonho que hoje Ã© real,abraÃ§o forte a todos pois vocÃªs sÃ£o pessoas encrivel devo muito a voces do Facebook.. Thanks Mathew for this post which I think is spot on. I’m still not sold on the “more value in closed platform” argument. I’d actually say the value is milked faster, but also goes away much faster. Google I think used to be the perfect counter example. They built on top of an open ecosystem and have been fostering it for years. It brought them enormous profits. My fear is that since they’re now starting to go down a more closed and proprietary ecosystem, their profits too will decline.